It’s not every day that a lens comes along that can be called a new concept for the professional shooter, but Canon has done it again: the new EF 8–15mm f/4L USM fisheye lens, now available for purchase, is a remarkable design that rewrites what’s possible with a fisheye lens. Whether you’re an underwater photographer, a wedding shooter looking for that exciting way to get a “different” picture, a commercial shooter, an HD videographer or an advanced enthusiast, this is a lens with potential you need to examine. These lenses give a definite curved look to straight lines, with their pronounced barrel distortion. But even used on a full-frame camera (or a traditional 35mm film camera), they cover the entire frame, corner to corner, with a diagonal angle of view of 180 degrees. Traditionally, these ultra-wide lenses have been around 15mm or 16mm in focal length. These are much more rare in today’s digital SLR world, but have been used for decades with traditional 35mm film SLRs.These lenses have even shorter focal lengths (around 7~8mm), and produce a small circular image in the center of the frame, surrounded by black, unexposed area on the outer areas of the frame. Like any fisheye lens, they certainly bend straight lines… but unlike the “full-frame” type, they generate an image whose outer edges are circular, and cover a 180-degree angle of view in every dimension, not just diagonally. 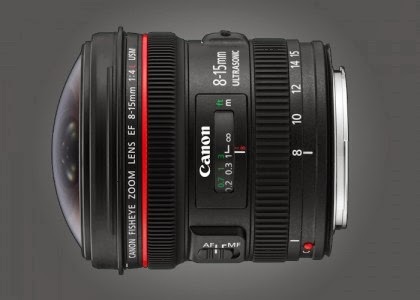 Up to now, Canon’s sole fisheye lens for autofocus SLRs has been the EF 15mm f/2.8 fisheye. This full-frame fisheye lens is highly-regarded for its image quality, but it was introduced back in 1987, long before digital SLRs with smaller-than-full-frame sensors were a reality. The EF 15mm fisheye lens has been used by many film and digital shooters over the years, but clearly is at its best on a full-frame camera. Used with an APS-C size sensor camera (such as the EOS 7D, for instance), the fisheye effect is minimized, because of the effective 1.6x “magnification” factor. This has meant that Canon users wanting a true full-frame fisheye effect have been limited to using full-frame cameras like the EOS-1Ds Mark III or EOS 5D Mark II. And since the launch of the EOS system, there’s been no true Circular Fisheye equivalent in the Canon system. This all changes with the new EF 8–15mm f/4L USM lens. - And at 15mm, you’re back to true full-frame fisheye coverage with a full-frame digital SLR, or with a traditional EOS film camera. Fisheye lenses have historically been an option pros have turned to, for turning a mundane scene into something memorable, or to add a totally different look to their coverage of an event. With the new EF 8–15mm f/4L USM Fisheye, Canon has now multiplied the options available to EOS shooters. .No longer a tool effectively limited to the full-frame digital SLR user, this lens will appeal to any professional shooter using EOS equipment, and for that matter to those experienced photo enthusiasts looking to broaden their optical horizons, literally and figuratively. It’s as much at home for the EOS 60D or even EOS Rebel user as it is for the EOS-1Ds photographer. Since it's theoretically possible to zoom to a setting that's too wide (for instance, with an APS-C type camera, setting the lens to its 8mm zoom position), and end up with significant vignetting at the outer edges, of the frame, there's a new locking mechanism to help prevent this. A zoom range limiter mechanism can be activated by flipping a switch, preventing the lens from being turned past its 10mm position (the proper position for corner-to-corner fisheye shots with APS-C cameras, like the EOS 7D or EOS Rebel series). This mechanism doesn't lock-in the 12mm position for EOS-1D series cameras (with APS-H-size sensors, and 1.3x crop factor), however, so 1D users will need to be mindful not to set the zoom ring wider than 12mm. The ring is marked with an "H" at the 12mm position, as a visual reminder. The ability for one lens to handle multiple fisheye tasks, which previously required two specialized and expensive lenses, has remarkable potential. A magazine or commercial shooter who works with full-frame cameras now has at his or her fingertips a single lens that can handle both full-frame fisheye and true circular fisheye tasks. Likewise, a photographer who may own multiple EOS camera bodies — for example, an EOS 5D Mark II and an EOS 7D — can now achieve the full-frame fisheye effect with both cameras. A photographer no longer has to choose between, say, the speed of an EOS-1D Mark IV and the full-frame sensor of an EOS-1Ds when a full-frame fisheye image is needed, because the new EF 8–15mm f/4L USM gives that option on either camera. Autofocus is now achieved with Canon’s newly-developed, powerful and silent ring-type Ultrasonic Motor. With USM focusing, the lens now has full-time Manual focus capability. Perhaps even more noteworthy, minimum focus is now down to about 6 inches from the film/sensor plane (0.15m), which produces an impressive maximum magnification of 0.39x at the lens’s 15mm position. This should even further enhance the lens’s usefulness for underwater photography (inside a protective underwater housing, of course!). Optically, this superb new lens combines an Aspherical lens element with a UD-glass element, in a totally new 14-element design. Chromatic aberration (“color fringing”), a common problem with ultra-wide lenses and digital SLRs, is strongly corrected in this lens, and overall image quality exceeds that of the previous Canon 15mm fisheye design. Another new feature is the specialized anti-smudge fluorine optical coating on the front- and rear-most surfaces, which resists dust, dirt and moisture, and makes cleaning significantly easier. Additionally, Canon’s Sub-Wavelength Structure coating (SWC), developed specifically to cut secondary reflections with digital SLRs, is used internally for maximum performance, even when shooting directly into bright light sources. - The new EF 8–15mm f/4L USM lens is equipped with both a specialized lens hood (Canon EW-77), and a dedicated front lens cap (Canon Lens Cap 8–15), which works in conjunction with the hood to protect the large front element when the lens is not being used. - There’s a gelatin filter holder at the rear of the lens, to hold pre-cut gelatin filters if color correction, neutral density or other filtration is needed. - Normal Evaluative camera metering can usually be used, but on full-frame cameras, if zoomed to the 8mm position, you may find switching to the Partial metering setting (which eliminates metering the outer areas of the frame) may provide more consistent results. Like all EF lenses, the lens can be used with automatic or manual exposure control. - E-TTL II (or E-TTL) flash can be used, but be aware that even with the Speedlite 580EX II’s 14mm wide panel in place, you will not get full corner-to-corner flash illumination coverage when using a fisheye lens, because of the lens’s unusual coverage. Wide-panel 14mm flash coverage will be effective with non-fisheye lenses, such as the EF 14mm f/2.8L II USM. In one move, Canon has suddenly changed the entire dynamic of what’s possible with a fisheye lens. Long regarded as a super-specialized lens for only occasional use, the EF 8–15mm f/4L USM’s stunning versatility makes it a powerful and compelling option for a broad variety of photographers. Its zoom range gives it not just composition flexibility, but literally transforms it into different lenses for different digital SLR camera bodies. Combined with a great AF system and excellent optics, it’s a lens that should find its way into the camera bags of many different shooters, pro and advanced amateur alike. Its relatively modest size, weight and a price that’s within range of many serious shooters only underline its appeal.